The idea of classifying materials by their topological properties is useful for predicting their behavior, especially at interfaces between insulators. When a topologically nontrivial insulator (often referred to as a topological insulator) is fused to a topologically trivial insulator then metallic states arise at the interface between them. This concept has been fruitful for 3D and 2D materials and was recently extended to graphene nanoribbons (GNRs) in a theoretical paper by S. G. Louie and coworkers. While the 0D interface between two 1D GNRs of dissimilar topology cannot support a fully metallic phase like higher-dimensional topological insulators, it does generate its most basic constituent element: a single, unpaired electron occupying a localized state within the GNR bandgap. Controlled placement of topological interfaces in a GNR thus allows controlled placement of unpaired electrons that can interact to induce new electronic and magnetic behavior. Achieving the conditions that allow such topological control of GNR interfaces, however, requires atomically-precise structural control. I will discuss how we have succeeded, in collaboration with Felix Fischers group, in creating atomically-precise interfaces between topologically trivial and topologically nontrivial GNR segments, giving rise to topologically-driven interface states in new, controlled geometries. 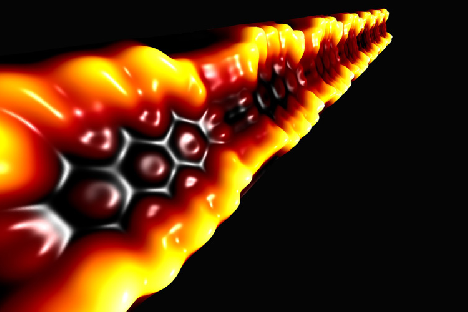 We have used this technique to create superlattices of interface states, yielding new GNR band structure. I will describe our efforts to synthesize these topological GNR heterostructures, as well as related GNR quantum dot systems, and to characterize them via STM spectroscopy and ab initio theoretical modeling performed by Steve Louies group. Topology provides a powerful new technique for engineering the electronic and magnetic properties of bottom-up synthesized molecular nanostructures.